I’ve always had an affinity for animals that can do amazing things and Homing Pigeons are no exception. Unlike most of us, Homing Pigeons do not require GPS technology to find their way home. A Homing Pigeon can reach maximum speeds of 75 mph and some of them can fly 300 miles without stopping. 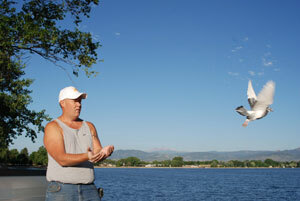 Jim Shumway is a resident of Loveland and he has a passion for raising and racing Homing Pigeons. When I interviewed Jim for the Loveland 365 Project I also had the opportunity to meet his parents who inspired him to carry on a family tradition of pigeon racing. Jim’s family has been racing Homing Pigeons for three generations. The raising and racing of Homing Pigeons is a serious endeavor. Aficionados purchase chicks from top breeders and these birds are used to develop a pedigree that can fly like the wind. A Homing Pigeon is not your average pigeon because they travel great distances at a high rate of speed. Consequently, they require specialized feeds, vitamins and fresh water to maintain optimal health and athletic performance. Jim’s pigeons have a good reason to return home because he built a nice “loft” in his backyard to keep them safe and comfortable. Jim’s owns approximately 75 Homing Pigeons and 16 of these are use for breeding purposes. When the young birds are old enough to fly, Jim will train them to be “homers” by releasing them at drop points like Lake Loveland. As the birds mature, the distance between the release point and the pigeon loft is increased. e.g. Burlington, Colorado. Homing Pigeons use significant landmarks, sound and the position of the sun to guide their flight path. Some are faster than others and that’s how pigeon racing became a sport. Jim prepares his birds for racing by placing a leg band with a computer chip on one of their legs. Birds are transported in specialized cages to the release point. Start time and GPS information is recorded and the race begins! When the pigeons return to Jim’s loft, they cross a landing board with a built in scanner. The scanner identifies the bird by its leg band and a flight time is recorded. 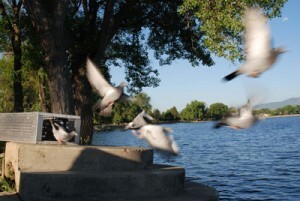 This entry was posted on Friday, August 6th, 2010 at 9:07 am	and is filed under Colorado, Loveland, Racing Pigeons, Ross Livingston. You can follow any responses to this entry through the RSS 2.0 feed. You can leave a response, or trackback from your own site. Nicely done article on a favorite activity of mine. Amazing how we humans can get lost even trying to fold a map and need a GPS to guide us around, these feathered friends not only find they why home, but they also race! So Cool!